Sgt. 1st Class Kyle Mahoney working on his computer. 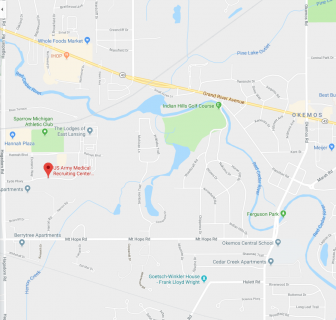 Meridian Township’s local Army Medical Recruiting Station, located off Hagadorn Road, is serving to help out not only the country, but the local community. Recruiters knit themselves into their local communities and can be found at high schools and community functions talking to people about the opportunities in the Army. “We go out and visit high schools like Okemos High School and the local colleges. We go to community events like fairs. Sometimes you can hear us on the local radio, and we’ve been on Fox 47,” said Mark Czarnecki, the Battalion public affairs official. The 13-year Army veteran has just moved to the area recently from Genesee County. Mahoney is looking to make a new bond with the members of the community and help as much as he can, which means he will be out and about in the township. 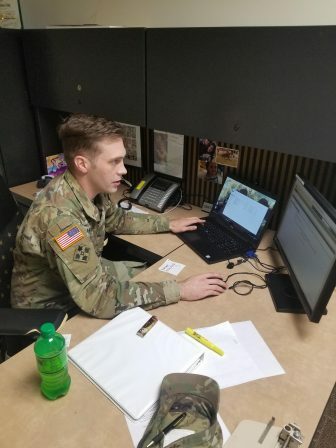 “I’m newer to the area, but I know of recruiting offices between the area and the entire Army and we push really hard to be a part of the communities, the local township here, and the campus of MSU,” said Mahoney. Mahoney before arriving to the Meridian Township area was previously stationed in Genesee County in Flint. He helped the community in its time of need during the Flint water crisis. “When I worked at Genesee County in Flint, during the Flint water crisis, we were very big into that. We were dropping off cases of water and hooking up filters for people,” said Mahoney. “The Midwest has a lot more challenges than elsewhere in the United States in overall recruiting. We are trying to increase the strength of the Army and that’s public knowledge. The Army has added a lot of incentives to help people have a higher urge to serve their country,” said Mahoney. Less than 1% of Americans serve in the Armed Forces (according to fivethirtyeight.com), so the Army are enticing more people to join by increasing benefits and bonuses. Depending on what rank and MOS (military occupational specialty) you chose, there are a variety of benefits to take advantage of. Different bonuses for different MOS’s can be seen at goarmy.com. What does the Army look for in recruits? “We look for highly qualified people of good moral character who can at least pass physical fitness. The biggest challenge in recruiting is finding people who meet our medical fitness standards,” said Mahoney. The military is not just about physical standards either, you must have a clean record to be considered, extensive background checks are done on all recruits. If you are looking to join you can contact your local recruiter, and if you are trying to be apart of the medical branch of the military you can visit your local Meridian Army Medical Recruiting Station located at; 2911 Eyde Pkwy #140.